I arrived home on Friday to find a large brown box on my dining room table. Because I organized CBBP #1, I guessed immediately that the package would likely be from the lovely and talented Jasmine from Confessions from a Cardamom Addict. I wish that I could say that I chose Jasmine, but the match-up for CBBP was actually rather systematic. Here’s how it worked. 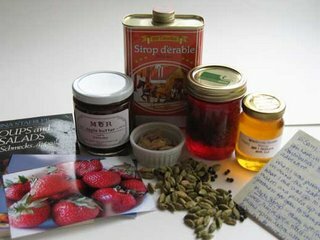 I created a list of the bloggers who emailed me their recipe link and postal address in the order that they contacted me. The CBBP bloggers were then sent the contact info of the person above them on the list. Jasmine was the first person to send her information, and I had included my name last on the list. Consequently, Jasmine sent her package to me. Of course, I had no idea what Jasmine was going to send. The generous parcel that Jasmine sent me included a warm handwritten letter explaining the contents of the package. When putting her package together, Jasmine kept in mind the Eat Local Challenge. So, she went to some of her local farmers markets for the majority of the items. The package included: maple syrup, apple butter, cherry jam, wildflower honey, a small cookbook, a trio of lovely photographs taken by Jasmine and, last but not least, small bags of black peppercorn, cardamom and homemade candied ginger. Jasmine said that these three spices represented her and her culinary traditions. The package was put together with thought and care. Thank you very much Jasmine! The nature of blogging by post is chance and surprise; that’s what makes it fun and exciting! Well done everyone! *I will be putting together a post round-up of the packages that CBBP participants received. If you would like your post to be included, send me an email, and I will gladly add your post to the round-up. Posted by Sam at 10:44 p.m. I'm so glad you got such a wonderful package! Jasmine is a tremendous person ... enjoy your goodies! Once again, Thank you! Your package as I mentioned was generous. I will be eating and making some wonderful treats to come. I can tell by the way Jasmine writes that she is an extremely warm and lovely person. Cheers to j ! Sam, your CBBP package looks like quite the treat. Enjoy your goodies; what a wonderful reward for a job well done on this first round of CBBP! I think a round-up of packages is a great idea. I haven't yet received my package, but will e-mail you the post once I receive and write about it! Thanks for your comments. I do hope that your package arrives soon Tania!